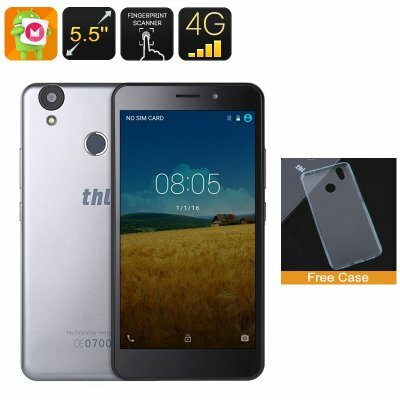 Successfully Added THL T9 Smartphone - 5.5 Inch HD Screen, 4G, Android 6.0, 2GB RAM, Fingerprint Scanner, 8MP Camera, 3000mAh Battery to your Shopping Cart. The THL T9 Pro Smartphone that boasts a spacious 5.5 inch HD display making it well suited to watching media and playing games. Beneath the stylish curved outer is a quad-core MTK CPU clocked at 1.3Ghz and paired with 2GB of RAM which lets the T9 Pro cope with all your games and movies without dropping a frame. Coming with the Android 6.0 operating system you'll have access to all the best apps and games from the Google Play store. Offering 2G 3G and 4G connectivity the THL T9 cell phone lets you enjoy super fast download speeds so you can easily stream HD videos. With two SIM card slots it's easy to manage your business and work contacts on the one devices or avoid roaming charges when traveling and with so many frequencies support you'll have comprehensive coverage over much of the globe. An 8MP camera located on the rear of this affordably cheap smart phone will let you snap excellent photos and offers up to 16MP images with its interpolated photography function. There is 16GB of internal data storage that can be expanded by up to 128GB additional memory with a micro SD card so you'll have space for movies and photos galore on this Android phone. There is advanced security on the THL T9 android phone thanks to the fingerprint scanner located on the rear. No longer will you struggle with passwords or pass-codes as with a simple touch of your finger you can unlock your smartphone in a split second. There is 3000mAh battery to bring you as much as 10 hours of talk time or hours of gaming and movie fun from every charge. This THL T9 Pro Android smartphone comes with a 12 months warranty, brought to you by the leader in smartphones as well as wholesale electronic gadgets.. Received in excellent condition, thrilled and trying to learn how to use. Have the service through Consumer Cellular.